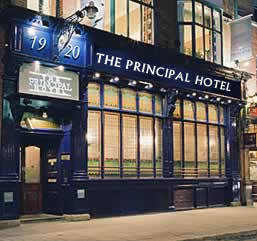 Nicely located in the trendy Temple Bar area is The Bewleys Principal Hotel. This high quality three star hotel offers exceptional value for money. The hotel offers roomy comfortable accommodation located in Dublin’s cultural quarters and is ideal for both business and leisure guests. The seventy en suite rooms in The Bewleys Principal Hotel are elegantly decorated to a fine standard. Every facility necessary for comfort is available including TV, direct dial telephones, tea and coffee making facilities, trouser presses and hair dryers. Convenient car parking can be availed of in the Temple Bar Car Park. This car park is opposite the hotel but there is an extra charge for this facility. The guest can dine in fine style from a wide variety of cuisine in a calm relaxed atmosphere. All meals are prepared to the highest international standards using fresh, local produce. The Bridge Bar is the ideal venue in which to unwind and enjoy a drink with that special one. Well known for the ceoil caint agus craic the bar also offers traditional Irish music sessions. The Bewleys Principal Hotel is conveniently located in fashionable Temple Bar with its selection of bars, cafes, restaurants, galleries and shops. The hotel is just a step from Grafton Street renowned for its shopping. Dublin’s main visitor attractions are located reasonably close to the hotel.